We are staying at the bottom of a cliff on Ibiza with relatively limited solving resources and had to drive across the island to the nearest ‘locutorio’ and cope in Ibizenco (the local version of Catalan) to get our weekly challenge – and the moment that I saw a quadruple carte blanche and the name Quinapalus, I knew that it was going to be that challenge. I read through the preamble and gave an awed gasp but did, of course, confirm that Quinapalus reserves his place at the Listener bar: after all, he is a previous winner of the Ascot Gold Cup. ‘Ale is recognised by these kings quaffing one (6)’ gave us SHAHS who were rather surprisingly drinking that beer but we put one (I) into them and got SHIAHS. So cheers, Quinapalus. The preamble warned us that we were looking for someone with two preoccupations that would appear to us just before a riddle in a work of one or three words in yet another unclued light. Some cells were going to contain two letters entered diagonally – obviously leading to two different answers and there were going to be two gaps. There was one redeeming feature – top-bottom mirror symmetry. We solved rather slowly as it was our turn to cook (for ten!) and these clues had the Sabre touch but with a few assumptions, I managed to begin a grid fill with that obvious KERB* giving us a Nellie or a BERK, and AITU, EMIGRE, RIZLA and KNEEPAD intersecting with it at the top right. Word lengths provided a putative grid but we were rather baffled by 38/41 and a string of clues from 30 to 42 that seemed to lead to those double solutions with letters entered diagonally: WITLESS/WITNESS, SCLIMS/SCRIMS, POOTER/POSTER, SCREE/SIREE, GLARY/GOARY, VEX/WEX (a new word for me and somewhat appropriate as the Ibiza temperature had just dropped to 8 degrees and it was pouring while we heard that in London the temperature was 29 degrees!) SUNG/LUNG and DORT/RORT. We should have found LEWIS CARROLL and the REV C L DODGSON a lot earlier – an obvious choice of theme for Quinapalus with his mathematical riddle. ARGAND. DIAGRAM appeared using the diagonal GR of the two names but it took us several more hours and some Googling to find the remaining diagonal letters that helped us spell out PHANTASMAGORIA and RHYME AND REASON. I found the first riddle and groaned to see that I had to solve a quadratic equation and that somehow the solutions were to be marked in the ARGAND DIAGRAM obviously using the axes of the original carte blanche grid. INDICES SURDS, MOVE BOTH Xs VERTICALLY, the corrected misprints told us. Fortunately there were five rather high-ranking CERN physicists in our party and I passed my problem over to them. X2 + 7X + 53 = 11/3. ” (Solving a quadratic equation is like falling off a log, they told me – it’s simple.) That’s minus 3.5 and plus or minus the square root of 37 i – that’s just a tad more than 6″. Then ensued a long discussion about exactly where in the grid we had to put those two Xs that we were moving vertically and marking (reasonably) accurately in the grid. I think that word ‘reasonably’ is an editorial addition to avoid another Poat hare. We have to have two solutions so those Xs must move just over the demarcation of their original cells (in TUXES and MIXEN) so that the also complete the words SEXT and SAXE and fill the empty cells and we have our two solutions. Too clever for me! It took us twenty-four hours to solve. I wonder how long it took to set. Many thanks to Quinapalus. I don’t know about you, but I found this one hard! I am not a particularly fast solver but this one was much nearer to 10 hours than the (perhaps) more typical 3+ hours-ish! I finished at around 1 a.m. Sunday. ‘See’ is WITNESS, ‘stupid’ gives WITLESS and the rest of the clue ‘confuse wisest’ is the jumble-based wordplay for WIT.ESS. Simple, eh? I could see from checked letters very early on that this must be KNEEPAD – but why? At long last I spotted that buckled should become BUCKLER, a protector according to Chambers, then it was PEE ‘N’ in DAK ( a letter), all reversed. Always hard when two of the pieces of a clue are unknown to you! Once a few letters started appearing in 5d I had .H.N..ND…… and wondered if it might be CHANSON DE GESTE, the Song Of Roland etc but that soon didn’t fit with other crossers. This was soon confirmed by finding, in the grid, RAP, in Row 5, (Dr.) DRE at 29ac, and the hip-hop stars NAS and ICE-T from Spirer’s film in contiguous cells in the grid. And, what with HIP and HOP being only one letter apart, this was surely part of the solution. There are those who feel I have completely lost the plot – and that the Solutions referred to in the Title are actually all drinks. Again, finding in contiguous cells, LAGER, RED, RUM, TEA & CHA, as well as (Creme de) CASSIS already at 35ac gives some substance to this argument. And when I found that PHANTASMAGORIA is a cocktail – involving melon & raspberry liqueurs with pineapple juice, if you’re asking – then that pretty much proved it. Maybe. But whoever heard of Listener setters & solvers liking alcohol, or a cup of tea, or both? I therefore obviously discounted this option. Finally, I’m riddled with some vague thought that a Quadratic might be involved somehow … but as that’s only of second order, I’ve ignored it. We’ve had some amazing puzzles in Listener 2018 series already but this must surely be one of the finest. Quinapalus has taken school-level Maths combined with a famous Oxford don’s poetry to create one of those delightful crossover puzzles that should suit polymaths everywhere. Tough wordplay, an astounding grid, multiple angles to a theme including poetry, solving quadratics and the oxymoron that is simple complex numbers. Though I suspect not everyone will agree, an ideal Listener puzzle, in my humble opinion! Has it really been over four years since Quinapalus’s last Listener?! The theme of that puzzle (No 4297 German Serial Composition) was the fabulous Hedy Lamarr and her contribution to mobile phone technology — frequency-hopping. This week, a carte blanche faced us — well, blanche apart from barred lines dividing the grid into its four quadrants. Eventually, it would have mirror-symmetry about the horizontal axis, which was unusual. 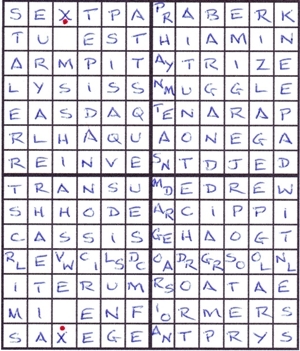 Fifteen clues contained two definitions to words differing by one letter and wordplay to the common letters. In the relevant cells, the two letters had to be entered diagonally “so that all grid entries can be read”. Another weird preamble-ism, and were the italics just to ensure that I read the word correctly?! The remaining clues had misprints in their definitions. I started off reasonably well, with 7ac BERK, 8dn EMIGRE, 9dn RIZLA, 11ac TUXES (loved the PJ/DJ misprint), 13ac THIAMIN and 17ac SMUGGLE/SNUGGLE, my first non-misprint clue. I thought it’d be fairly safe to put most of these in the top right corner, but that didn’t mean that the remaining clues in that quadrant were a doddle. As time progressed, the bottom right corner turned out to be a bit of a pig as well. Especially with a long preamble, it needs to be double-checked to make sure nothing is overlooked that helps the solving process. The first thing that I needed to reread the preamble to remind myself about: “Numbers in brackets are the number of cells in entries, two of which initially contain a gap.” Consequently, I failed for far too long to realise that 1ac and 46ac had only 3-letter answers, SET and SAE, despite their (4) designation. Other traps I set myself were thinking that the correct version of “wellie” at 7ac was “wallie” rather than “nellie”, and overlooking the 3-letter entry at 12dn by putting four bars at the top and bottom of column 4. I put the alternatives I had so far into row 11 and column 7. In fact, the options could go diagonally in either order. Were these then the two solutions referenced by the title, and would JEG have to accept them in either order? Oh well, his shoulders are broad. This can’t be right, the quarterly mathematical wasn’t for a couple of weeks. However, that good old quaratic formula, which was drummed into me at school, came to the rescue! Well that stumped me, as it required the square root of -1335. Time to change tack for a bit. I still had to decipher 14dn which looked as though it ended in DIAGRAM. At this point, a grin crossed my face as I saw that this determined the order of the two surnames and thus the two book references. JEG would have a (relatively) easy time, after all. The two X’s were in column 3 and moving them up/down into the empty cells gave SEXT and SAXE, leaving behind TUES and MIEN. Their main role though was to tell us where to plot the two values of x, but what exactly were they? Luckily, Wolfram came to the rescue again with a button to show “Approximate forms”. This showed x ≈ -3.5 ± 6.0896i. So I plotted a point half way along cell 3 in the top and bottom rows, and approximately 0.1 up/down. At least, I think that’s what was required of us. Whether I got everything right, or made a silly mistake, this was a phenominal puzzle from Quinapalus. Many thanks for a fascinating journey.